Cool, grey weather + creative mojo. Something about this time of year makes all the wheels turn in my head at a thousand miles per hour. Here are a few things I've been working on. I'm excited to be a part of Omni Art House's 2nd Annual Version Mary 2 Exhibition. The finished pieces will be available to purchase online this Spring. More info on that soon! I've been working almost solely on large canvases for the majority of the last 6 months, and as much as I've loved challenging myself to work on a larger scale, the simplicity of ink on paper will always be my favorite. I've been trying to shift back into creative mode after Miami and the holidays, and starting this piece did the trick. Thanks to Bucketfeet, a shoe company filled to the brim with original artist designs, I was chosen as one of fifty finalists in their "Made to Stand Out" competition. 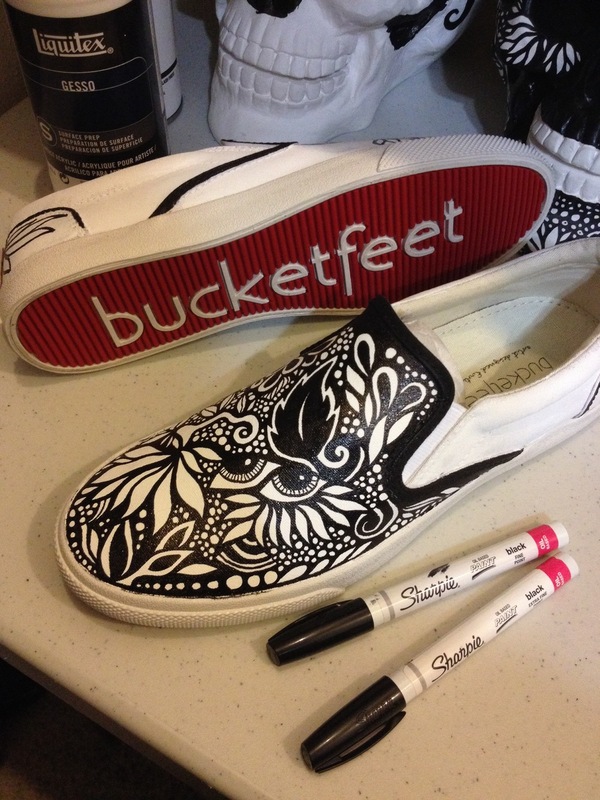 As I type this, artists from around the country are doing their magic on blank Bucketfeet shoes! In early February, the top three winners will be chosen and go on to show their original shoes in the Bucketfeet booth at SCOPE New York this Spring. The grand prize winner will win a coveted shoe contract, and have their design at SCOPE Miami 2014! I'm extremely pleased with how they are coming along. I've managed to destroy these Sharpie paint markers, so I need to pick up reinforcements to finish them up. I'll be posting the final product and how to vote soon! I'll be posting a recap of last month's amazing trip to SCOPE Miami very soon. I'm hoping to be much more active on my site in 2014. As always, thank you for following my inky ramblings.